My intention was not to stir up the hornets nest of fear mongers scared of violent entertainment nor the zealots of jovial gore. This post actually started because did two things in short succession. First, I watched Hugo, which is a delightful and wonderfully made film by Martin Scorsese about cinema and the wonder, and occasional danger, of technological progress. Scorsese shot the film in 3D and it is an absolute marvel to watch. Like Cameron before him, Scorsese makes a compelling argument that 3D film making can be as magical as color in cinema if used deftly and with tact. 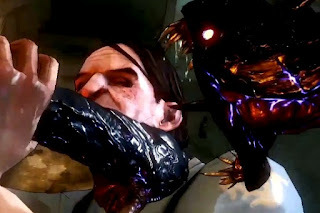 After partaking in some child-like wonder, I then played The Darkness 2, which forges a very adult experience. The gore in this game is so over the top I started to marvel at the absurd violence. I think I used to be more squeamish and sensitive to this type of content. What happened? And what will continue to happen? At some point, when game designers reach the upper tiers of photorealism and start wielding 3D as effortlessly as Scorsese, will I consume this content so easily? Honestly, I don't know. Some depictions of violence are too much for me to handle. I also wrestle with the value of depicting violence towards civilians or children in certain games. My opinions are by no means settled. But this is precisely why I want to think of these moral concerns early. Moral boundaries shift, and that is normal. I just do not want them shifting without my knowledge. The Darkness 2 is generally innocuous, but who knows, maybe I will be playing a Saw derivative some day, happily tearing people limb from limb, ignorant of the borders I thought I would never cross. My problem with a lot of video game violence is that it is obviously supposed to be entertaining on the surface. We can brush it off by saying that it's "over the top" and "absurd" or whatever, but that just raises the question: so what's the point? Why am I playing this? Why did you make it? We often use the word "adult" or "mature" to describe such content, but I don't think I'd call The Darkness II a very adult game. I recently started playing Metal Gear Solid 4, a series which is also quite violent, but offers a much smarter and more sophisticated take on violence. The game opens with a violent sequence where tons of faceless mercenaries are gunned down in the street, and the whole scene was presented with a sort of compassion. Much of the game's violence is optional (sneaking is preferred to shooting), and the game really hammers home the point that years of warfare has a detrimental, almost poisonous affect on Snake. He literally ages faster than normal because of his status as an engineered soldier. Even if the player is still supposed to 'enjoy' violence - in the sense that it is engaging gameplay - I don't think players are supposed to revel in it. *That* is a game that treats violence as a serious subject. For many other video games, I am slowly coming around to the idea that lots of developers are simply profiting from the glamorization of violence. So the interesting thing in The Darkness (at least in the first one) was that all of the violence was always juxtaposed by super quite, almost tender moments, like the Jenny scenes or the orphanage. Which kinda let both of them have a stronger impact. Man, I really have high hopes for the seque, The Darkness might be one of my favorite shooters of all time. I generally agree. Something like The Darkness II is hard to peg as an adult game, although portions of is certainly are. As Christian mentions below, the violence does juxtapose quite well with the story elements, and makes some emotional moments more compelling. Yet the game revels a bit too much in its "clever" gore. I can't take violence seriously if the designers themselves have trouble doing the same. As I mentioned above, the juxtaposition between violence and darkness and the color and brilliance of moments with Jenny make some of the emotional moments of the game quite compelling, but I'm not entirely sure there is enough to make up for the rest. I genuinely hope you like the game more than I. My review should be up sometime soon.